The Jolanda School of Magic. Magic is actually a change of consciousness. The right attitude and an open, loving heart have created more miracles than all the magic tricks put together that has ever been performed since the beginning of time. The tower with its eight corner shape is the perfect school-building, because the knowledge of the circle of the eight directions is elemental in all indigenous peoples belief-systems. The system of tarot offers endless possibilities to care for one’s life in a deeper, more healing sense. This weekend includes a general overlook into the system of the cards, as well as practical exercises to enhance inner psychic abilities, intuition, vision, precognition, dreams. 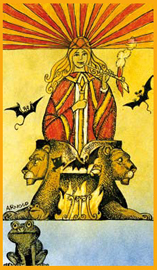 The participant learn to understand the main principles of Tarot, and how the cards can be used in the everyday life. In the process of creating the hat the teachings of magic comes natural. After many years as a witch, Rosie has found out an easy method to make a very fine hat. All one need is a piece of cloth, glue, aluminium-thread and a pair of scissors. Witchcraft/shamanism is an ecological belief-system – energy – movement. 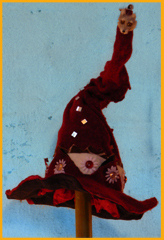 To create one’s own hat gives meaning, connection to the elementals, and emotional healing. Every hat will be special for its maker. Late Sunday afternoon all participants will have their own unique hat full of wonderful, creative ideas to bring with them home. Every aspect of our being, the emotional, mental, physical and spiritual, are tools for our sexualities full expression. The sexuality is the catalyst that stimulates growing and opening of each and every one of these aspects. When there is pain or suffering in any of these areas, our sexuality is prevented from experiencing it’s full potential. Therefore it is through healing and balancing of all aspects of self that the free flow of sexual energy can occur. 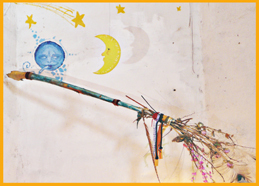 Meanwhile the makings of our brooms take place, the teachings of the art of magic comes natural. When the broom is ready, not only have we synchronized ourselves with nature, we’ve also increased our ability to enjoy life and have fun! Have Jolanda School come to you! Gather 7 – 20 people, find a location, and Rosie will come flying! Have you always dreamed of having a witch-hat of your own? Decide what colors and which symbols you want on your hat, e-mail Rosie. Around three weeks later you can pick your new, very special, custom-made hat up at the post-office. from the abundant knowledge found among the different native american nationss traditions called Sweet Medicine. The teachings are put together by the elders amongst traditional natives called the Twisted Hair. The Twisted hair were all warriors from many different people and nations all over north-, south-, and central-america continent, which by the natives were called the Turtle Island. A Twisted Hair warrior was usually a respected medicinewoman/man, shaman, witch, magician, and a member of their own peoples secret lodge of medicine or magic, and was regarded upon as having power and knowledge. They were not blindly set on only accepting their own tribes traditional teachings, but they also had the ability and the will to look for knowledge from all kinds of different sources. So they travelled around looking for knowledge from all directions on the wheel of life to find their own inner center in perfect harmony with the Great Spirit. Different tribes had the same wheel of life but they put the different energies in different places on the wheel. Some associated for example the color red with north on their wheel, others with west, others with east. In the forn-nordic tradition our ancestors put the color red in south on their wheel. The point is that when you put the different wheels on top of each other together they create a rainbow!
' Todays western education is solely about letting the students repeat and digest ideas thought out by someone else, and that are political correct. When our head is full of already thought of thoughts there isn’t much space left for original thoughts. Yet our souls travel towards maturity and the conditions prevailing on the planet today makes the necessity for us earthlings to think original, creative thoughts. The need is bigger than ever. To really learn how to think independently is the key to become the free individual that it is our birthright to be. Allow yourself to drop all the thinking you’ve been taught to think and let the answers come from a deep ocean of knowledge that exists deep within you. The only true knowledge is the knowledge about the self.